Meatloaf divides us as a people. Some people are so profoundly dedicated to the version they ate growing up, they are unable to brook the recipe of another. There are those who cotton to pork, and others who swear a mix of two or three meats is best. Ketchup or no ketchup? This question alone could start a minor Twitter war. Me, I go all ways. My mother’s recipe was heavy on the beef, but yet I remember it fondly. I have made a spicy version I found here that is terrific. I am down with bobotie. Veal? Yeah I’ll try that. In summary: I am meatloaf promiscuous. Because I get a weekly delivery of ground turkey meat, meatloaf occasionally crosses my mind. The thing I really like about Rosemary Turkey Meatloaf is that you are getting a lot of flavor out of few ingredients, which is sort of the gold standard of weeknight recipes, along with one-bowl preparation. The key ingredient here is really the rosemary, which gives the meat both a distinctive flavor and a lovely aroma. Most of these ingredients you will have laying around the house – I do not keep seasoned breadcrumbs so I used panko mixed with oregano dried from my garden last summer – and my very best canned tomatoes. Pause here to note I talk a lot about panko. It is the black boots of my pantry people, or, if you prefer, Spanx, because it just holds the world together. You are dealing with poultry here, so what you have is a very solid texture. To mitigate this: do not over mix, do not over cook, make sure you are generous with your glaze and slice your dinner up thinly. This meatloaf may not be mama’s, but it belongs in her family, sitting shyly at the table with the more aggressive members. I made this last week and it was incredible! My first meatloaf, my first time, and it was perfect. I had leftover sauce, though, but I ended up pouring it on top of my slice after it came out of the oven because you literally can't get enough of it. Thank you! Just brought home ground turkey to make this tonight. We are a family of meatloaf lovers (with lots of ketchup) and I know this will be a hit! Thank you for sharing. This is cooking in the oven right now! I am going to the store today to buy panko.....and will now refer to it as "kitchen spanx". So funny..and the recipe looks like a perfect weeknight dinner...I'll bet you could double this and freeze a loaf. Meatloaf, tick. Panko, tick. My picky second daughter adores Oliver Clark's meatloaf (Merrill featured it on food52, post-her-wedding) and it is a STAPLE in my house. On Oliver Clark's meatloaf (which finishes with a ketchup topping.....), I must say the combination of the three meats is wonderful (now 2 meats for me since I can only get pork and beef - no veal, at home in Nigeria). 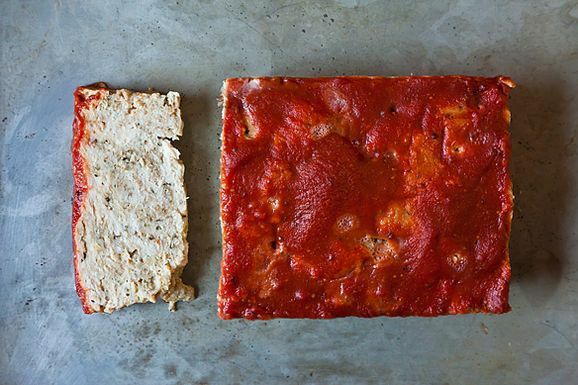 Sometimes, I'll crumble half the loaf in some tomato sauce for a tasty bolognaise (I posted 10 things to do with meatloaf on food52). Meatloaf rocks. Is what I'm trying to say :-). Thanks Jenny. i would not use chicken unless you can get all dark meat cos i think it would be dry. what about with pork? anyone? Agree with you on panko. There's a bin of it in my pantry right next to the flours. Looking forward to trying this recipe. You are really on for this one. Smiling from ear to ear...my mom always used Heinz Chili Sauce! actually am i weird to think heinz chili sauce would be yummy on this? I have really never met a meatloaf I didn't like. I even liked college dining hall meatloaf. Of course, mine is the best, natch. is it on the site? The ingredient list on the recipe was missing eggs. We used 2 eggs when we made it for the photo shoot. We've adjusted the ingredient list and the recipe on the post. Hope that helps! I did but upon reflection maybe i only used one. i would use two as instructed. as for the cooking time, i can't really remember tho it is dense so you should check it as you would any meat. Eggs are mentioned in the recipe instructions, but are not in the list of ingredients. Did you use eggs, Jenny? This is perfect for tonight, which I have been obsessing about since I got up this morning, since tomorrow I get to eat at Prune. I want to leave a lot of something tasty in the fridge for my generous left-behind spouse when I peel out of town. Always looking for something good to do with ground turkey! The meatloaf was delicious and at Prune I had scrumptious goat ragout on hominy with rosemary, so there is a certain symmetry between the meatloaf and the goat. Sort of.